Reading and share top 11 famous quotes and sayings about False Beliefs by famous authors and people. Browse top 11 famous quotes and sayings about False Beliefs by most favorite authors. 1. "...the student of prehistoric man...cannot reject [the Castenedolo skull] as false without doing injury to his sense of truth, and he cannot accept it as fact without shattering his accepted beliefs." 2. 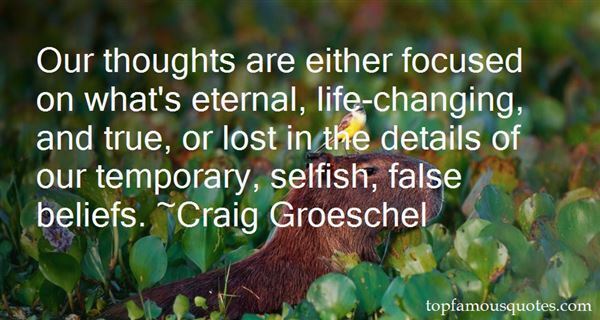 "Our thoughts are either focused on what's eternal, life-changing, and true, or lost in the details of our temporary, selfish, false beliefs." 3. "A lie believed acts as truth until it is neutralized." The false beliefs you hold about your life become the personal laws of your life, holding you prisoner until you break your agreement with them." 4. "He sees daily evidence that many things held to be true by nine-tenths of all men are, in reality, false, and he is thereby apt to acquire a doubt of everything, including his own beliefs." 5. 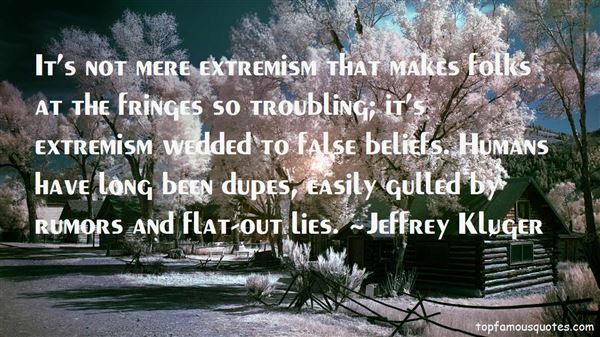 "It's not mere extremism that makes folks at the fringes so troubling; it's extremism wedded to false beliefs. Humans have long been dupes, easily gulled by rumors and flat-out lies." 6. "We don't see the truth because we are blind. What blinds us are all those false beliefs we have in our mind. We have the need to be right and to make others wrong. We trust what we believe, and our beliefs set us up for suffering." 7. "The disease of the soul is both more common and more deadly than the disease of the body. Just as medicine is the art devoted to healing the body, so philosophy is the art devoted to healing the soul, curing it of improper emotions, false beliefs, and faulty judgments, which are the causes of so much hardship and handicap. To heal the body one turns to the practitioner of the art of healing the body, but to heal the soul there is no doctor to turn to, and each of us is left to become that doctor unto himself. Yet, this need not stop us from exhorting others to imitate us in the godly art, in the forlorn hope that they might transform themselves into better citizens for Athens and better companions for us." 8. "Any account of science which does not explicitly describe it as something we believe in is essentially incomplete and a false pretense. It amounts to a claim that science is essentially different from and superior to all human beliefs that are not scientific statements--and this is untrue." 9. "Because of this false idea, they devised an aesthetic belief in making the exterior of an object a reflection of the practical functions of the interior and of the constructive idea. Yet these analyses of utility and necessity that, according to their beliefs, should be the basis for the construction of any object created by humanity become immediately absurd once we analyze all the object being manufactured today. A fork or a bed cannot come to be considered necessary for humanity's life and health, and yet retain a relative value.They are 'learned necessities.' Modern human beings are suffocating under necessities like televisions, refrigerators, etc. And in the process making it impossible to live their real lives. Obviously we are not against modern technology, but we are against any notion of the absolute necessity of objects, to the point even of doubting their real utility. 'Asger Jorn"
10. 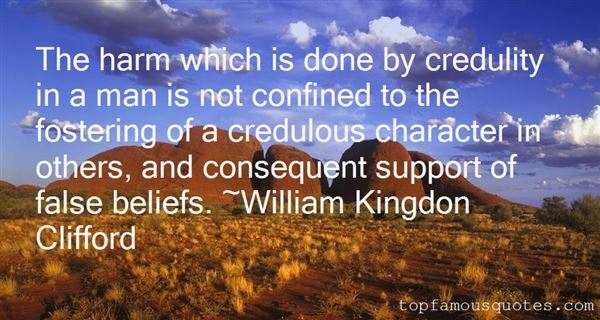 "Renouncing false beliefs will not usher in the millennium. Few things about the strategy of contemporary apologists are more repellent than their frequent recourse to spurious alternatives. The lesser lights inform us that the alternative to Christianity is materialism, thus showing how little they have read, while the greater lights talk as if the alternative were bound to be a shallow and inane optimism. I don't believe that man will turn this earth into a bed of roses either with the aid of God or without it. Nor does life among the roses strike me as a dream from which one would not care to wake up after a very short time." 11. "The harm which is done by credulity in a man is not confined to the fostering of a credulous character in others, and consequent support of false beliefs." I can say that I have fallen deeper in love with you today, knowing the sort of man you are."